James Hung’s collection of county bees looks like a menagerie of Insects Gone Wild — gnat-sized bugs with long snouts, gigantic black bees and curious iridescent creatures with termite-like wings. “When I first started studying native bees, I really didn’t know that there was this much diversity,” admits Hung, a doctoral student in UC San Diego’s Division of Biological Sciences, pointing to the thousands of San Diego bees he’s carefully pinned and catalogued in the dozens of wood-framed and cardboard boxes stacked in his laboratory. Hung has collected more than 17,000 wild bees from coastal, desert and mountain areas of San Diego County. Since he began his thesis research project three years ago to determine the impact of development and habitat fragmentation on San Diego’s native bee populations — one of the most diverse in the world — the 25-year-old grad student has amassed one of the most complete collections of these little-known but ecologically important insects from one of the world’s hotspots of bee diversity. 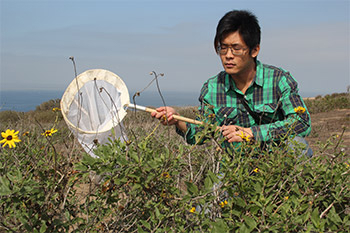 It’s a collection so important to biologists that the San Diego Natural History Museum is now collaborating with Hung — who has become the go-to guy on the region’s native bees—to develop a complete inventory of all the bees in San Diego County. As one of the worst droughts on record this year wreaks havoc on California’s agricultural crops and natural plants, Hung’s inside knowledge about the relative abundance of native bees—which begin emerging from their underground nests during the spring flowering season— could also provide scientists with clues to the long-term impact of the current drought to natural ecosystems in San Diego. Local extinctions of native bees might not only affect the survival and diversity of the region’s plants but could also impact the pollination of agricultural crops. California’s $3-billion-a-year almond industry, the state’s number one agricultural export, spends $239 million annually to import more than one million honey bee colonies from other states to pollinate its almond trees due largely to the sharp decline of local honey bees from Colony Collapse Disorder. But a study published last year in the journal Science found that wild insects such as native bees may contribute 50 percent or more to the pollination of agricultural crops around the world, much more than experts realized. “Studies are beginning to show that even in agricultural systems where honey bees are doing most of the work, they will do a better job if there are native bees around because honey bee movement patterns are more conducive to effective pollination when they are bumping into native bees as they go from flower to flower,” explains Hung. Why these economically and ecologically important insects are so underappreciated is probably due to the fact that people simply don’t know they exist. Stand over a wildflower for a minute and chances are good that black speck you may have at first dismissed as dirt, then assumed was a gnat or some other tiny bug once it started crawling, is probably a native bee in the process of pollinating the plant. It might seem incredibly simple, but standing over flowers is the main way Hung and some of the undergraduate students who’ve helped him have found the more than 350 native bee species in his collection over the past three years. “The best way is to stand there and look at a flower and a bee will probably show up,” Hung says. Once he spots his quarry, it takes Hung only a second to capture the victim, using a rapid swoop of his insect net (he makes sure to finish the swing with a tennis-like follow through to assure the bees’ capture). Then he plops the insect into a plastic tube for the trip back to his laboratory. Although wild bees are generally well known to taxonomists, with more than 20,000 described species around the world—more than the number of known birds, but far less than the number of known beetles—San Diego’s bee population strangely hadn’t gained much interest from biologists until Hung began his work. “San Diego as it turns out is relatively under-sampled with respect to its bee fauna,” says Holway, adding that it’s a mystery, given the native bees’ relatively large importance to the ecosystem and economy. 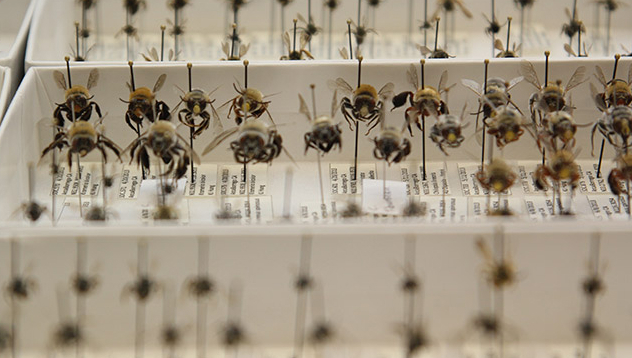 In his collection, Hung has many undescribed bee species new to science, such as a parasitic bee he recently collected in the Anza-Borrego Desert. He’s photographed species of bees never before photographed in nature in places one wouldn’t expect, such as local parks like Mission Trails Regional Park. And in recent years, he’s become a kind of one-man, bee PR machine in an effort to educate the local community about the importance of the native bees that exist (quite literally) under our very noses. Just about every other month, he’s leading nature walks to search for bees in local parks, visiting elementary and high schools with his bees or lecturing to local nature and plant societies. He’s recently started a blog for anyone interested in the region’s native bees. Like most modern-day biologists, Hung embraces a molecular approach to his research, submitting DNA sequence data from some of his unusual bees to an international database of living organisms. 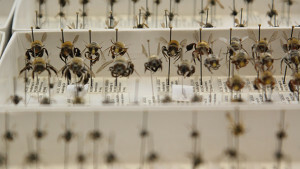 But in an age when biologists are more likely to focus on genetic sequences and biochemical pathways than systematics—the description and classification of living organisms—his work in revealing the hidden lives of San Diego’s bee population demonstrates that “old school” taxonomy still offers a lot of value to science.